The print room of the Rijksmuseum mounted magnificent exhibitions on two very different Dutch landscape artists, the portrayer of Brazil Frans Post and the traveler in his own imagination Hercules Segers. The juxtaposition brings Schwartz to compare them; he finds out that they both came to the same sorry end. Before the major remodelling of the Rijksmuseum between 2003 and 2013 the museum print room had its own space for exhibitions. It was an L-shaped area off the right entrance, joining a narrow to a wider corridor, with a mini-rotonda for the top displays in the right angle at the bend. The Rijksprentenkabinet (National Print Room) used the unglamorous space well. It held a constant stream of exhibitions, mainly from the vast riches of its own collections, in excess of half a million prints and 50,000 drawings. Exhibitions on big names sometimes drew in the crowds, but most were visited mainly by dedicated lovers of the graphic arts. More than a little prior knowledge is assumed on the part of a museumgoer who would come to delectate an exhibition on the graphic treasures of Michiel Hinloopen – one of the best! – or the prints of Yoshihara. The setup in the New Rijksmuseum is different. The print room has been allotted five small cabinets tucked into the main galleries, for rotating shows of new acquisitions or thematic displays. The upshot, which I cannot say is unfair, is that the print room has lowered the threshold for day-trippers and raised it for cognoscenti, who now have to mix with the throngs and search out the cabinets to see what’s on show. To be frank, while I was a regular visitor of the old-style exhibitions, not once in the past three years have I yet gone on a prints-and-drawings quest of that kind. Having confessed this in public, I have now resolved to look for the cabinets in future visits to the Rijksmuseum. The thirty-four drawings by Frans Post in the exhibition are a once-in-a-lifetime discovery by a curator of the Noord-Hollands Archief, Alexander de Bruin. 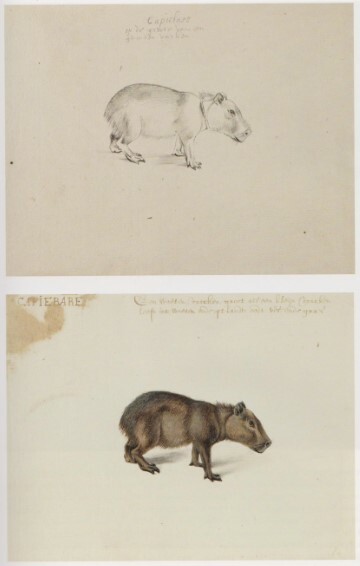 In the course of a systematic survey of the drawings in the archive of the Noord-Holland provincial archive de Bruijn came across a cache of drawings of animals that he was quickly able to relate to the Haarlem artist Frans Post (1612-80). The animals are Brazilian species of the kind that we find as details in paintings by Post. Post was one of the expedition artists in the service of the governor of Brazil, Count Johan Maurits van Nassau-Siegen (1604-79). He sailed with Johan Maurits when the German-Dutch conquistador took over most of Brazil from the Portuguese in 1637 and he stayed there for seven years, until 1644. Until now, only paintings of Brazil made by Frans Post were known. They are richly stocked with exotic plants and animals that have long been thought to have been made after drawings by the artist, but none had ever turned up. The Haarlem sheets fit that description. That the gouache served as the model for the captivating star of Post’s painting in the Louvre can bear no doubt. He was however not the only artist in Johan Maurits’s entourage, so the link between drawings and painting does not clinch the attribution to him. One of de Bruin’s arguments for regarding them as the work of Post himself, which convince me, concerns the origins of his paintings of Brazil. Only six of the surviving paintings were made in Brazil itself. 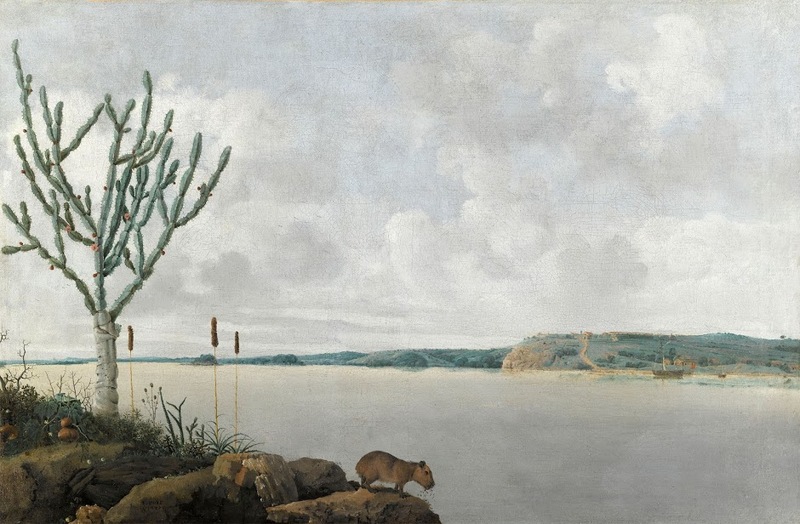 Nearly 140 additional paintings of Brazil date from after Post’s return, and many of those also show animals we find in the drawings, which therefore must have remained in his possession. This was not likely to have been the case if they were made by anyone else. The drawings of other participants in the expedition reverted to Johan Maurits. 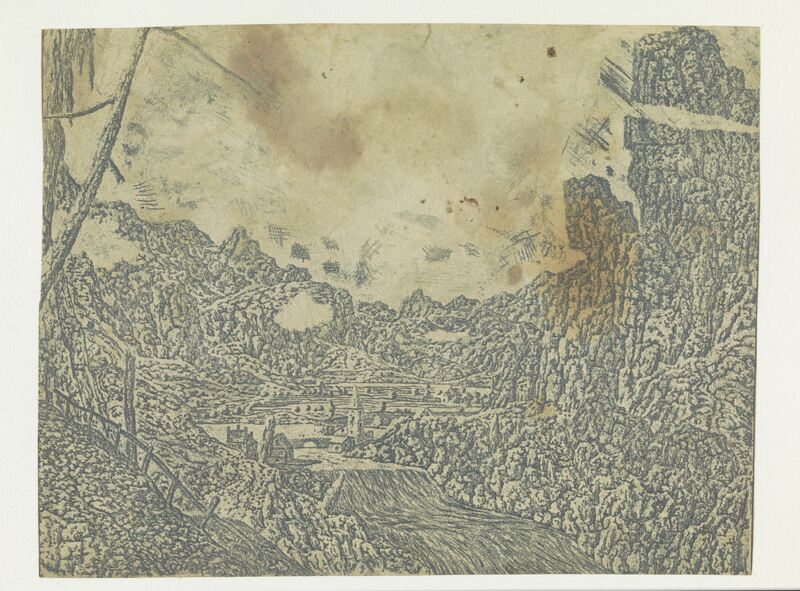 Line etching with tone and highlights, 15.2 x 18.8 cm. Above an impression in the Rijksmuseum, nr. RP-P-OB-827, printed in dark green ink on a dark pink ground, varnished. 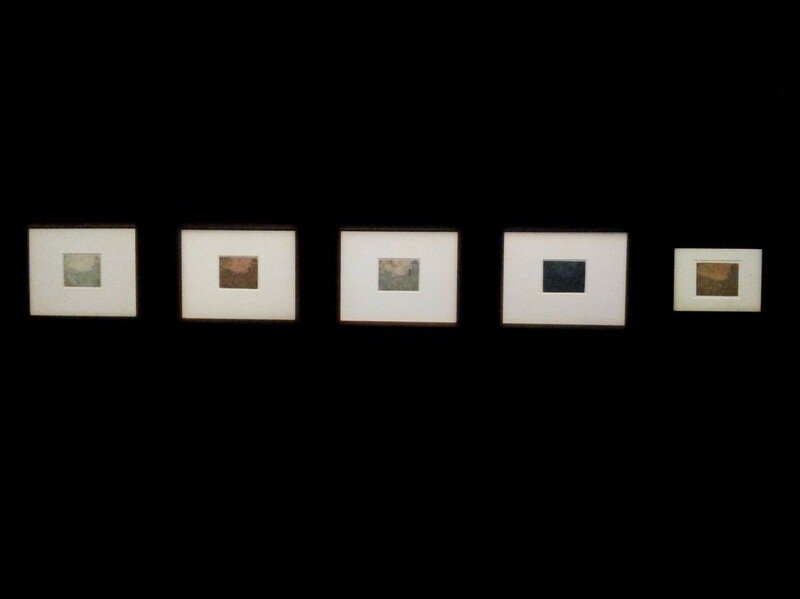 The above (center) and four other impressions of the etching, three from the Rijksmuseum and one from the Bibliothèque nationale de France, in different colorings, some by brush. 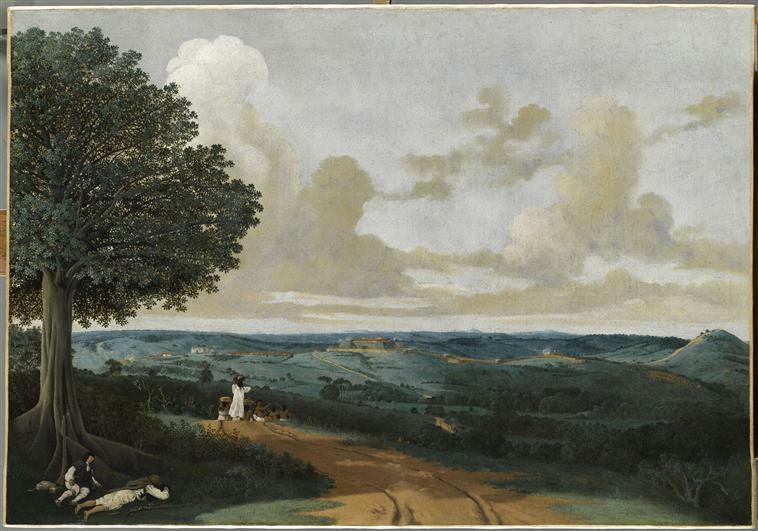 There is disagreement concerning the relationship of this print to another of the same motif and dimensions, called the “first version,” but which is now believed to be another state of the same plate. Here an unfortunate real-life resemblance between the artists is evinced. 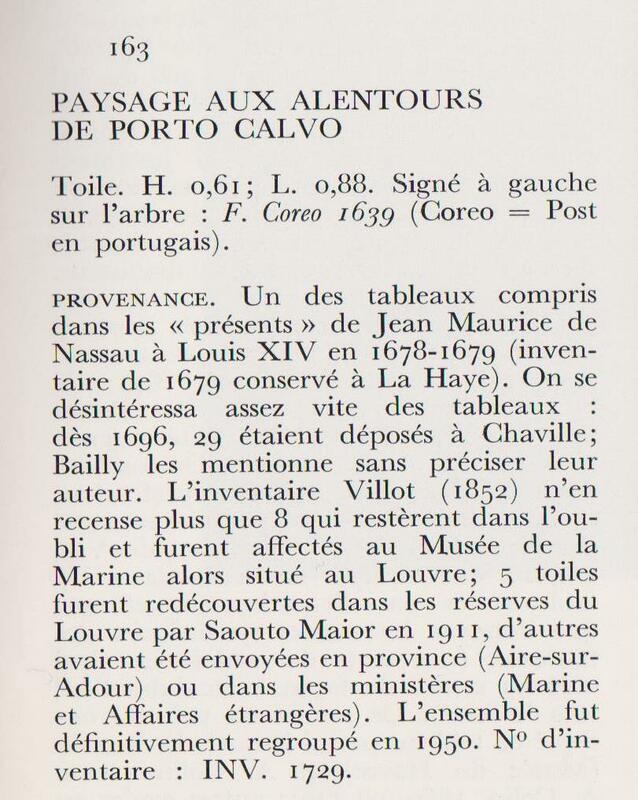 In 1679 Johan Maurits sent forty paintings from his Brazil venture to the French court as a present to Louis XIV. Alexander de Bruin: “Johan Maurits apparently considered sending Post to accompany the paintings to France in order to explain the works to the king.” His agent Jacob Cohen, who was organizing the transport, “wrote that this would have been a splendid idea had Post ‘not fallen unnoticed into drunkenness and trembling’ and that his friends did not think he was ‘in any condition to present himself before a king or to go on such a long trip.’” A year later Post died. As opposed to Segers, after Post’s death his work declined in value. See this summary provenance of Johan Maurits’s gift. Which only goes to show: think twice about the recipient before giving away a nice work of art as a present. For two weeks after Election Day I was reasonably well in control of my horror, fear, rage, indignation, confusion, sorrow, anger, bitterness, reproach and again fear. It helped that Loekie and I had a powerful diversion, a trip to Adelaide, Melbourne, Apollo Bay and Sydney. That was until the morning of 23 November. I was watching CNN in bed in a hotel room in Hong Kong, on the way home, when they showed the video of a roomful of Americans chanting Hail Trump with their arms raised in the Nazi salute, down the street from the White House. By then I had seen it a few times without showing outward signs of the sickening emotions it inspired. But then CNN, in a disordered reflex of supposed evenhandedness, gave the screen to the odious racist Jeffrey Lord. “These are people standing up for their identity,” I heard him say, “just like some Black Lives Matter or sexual group might do.” Overcome not only by what he said but also by knowing that this was being broadcast all over the world as an American voice, I lost it and broke down. It’s no longer that It Can’t Happen Here – it is happening here. The election of Barack Obama in 2008 made me feel better about my native country than any time since before the assassination of John F. Kennedy. No matter what kind of president he becomes, I said to myself, the gain has already been pocketed. That the American electorate could vote in a black president was the most wonderful political event I had ever experienced. The admirable personal qualities of the Obamas added a glow of warmth to the feeling. On November 8th, 2016 the opposite sensation seized me. No matter what kind of president Donald Trump turns out to be, fearful damage has already been done. It may not be irreparable, but I won’t be around to find out if it is. I have regained sufficient power over myself so that the election no longer spoils my enjoyment of life. I wish you the same, with happy holidays and fulfillment in the new year and years to come.